A key highlight of the festival is IDF 2018, the largest design conference in the country which will be held on November, 23 - 24 2018 at UB City Amphitheatre, Bengaluru. The Festival aims to engage diverse audiences via a series of design interventions. The collaboration with IDF 2018 aims to provide a platform for industry experts, professionals and emerging design talent to interact and debate with their counterparts from around the world to create awareness on the power of design in India. For 2018, discussions will focus on the best design trends and technologies shaping the future as well as introducing new concepts, products and services that demonstrate how design is transforming contemporary living. Renowned Indian and international design practitioners and thought-leaders will speak about the most exciting and impactful developments in design today. Some of the key International speakers include Brendan McGetrick, Curator, Global Grad Show, UK, Brian Parkes, CEO, JamFactory, Australia, Chris Solarski, Artist/Game Designer, Switzerland, Christian Girard, Co-Founder, Digital Knowledge, France, Kai Richter, Chief Designer, SAP, Germany, Karolina Merska, Artist/Designer, UK, Philippe Morel, Co-Founder, Digital Knowledge, France and Steve Lidbury, Managing Principal, Eight Inc. London amongst others. Speakers participating from India include Abimanyu Nohwar, Founder, Kiba Design, Biren Ghose, CEO, Technicolour, Francois Gramoli, Creative Director, WeWork, Gunjan Gupta, Furniture Designer and Founder of Wrap, Kamal & Shibanee Sagar, Co-Founders, Total Environment Building Systems, Karthik Vaidyanathan, Founder, Varnam Craft Collective, Malika Verma Kashyap, Founder, Border & Fall, Prateek Jain, Co-Founder, Klove Studio, Revati Kant, Chief Design Officer, Titan Company Limited, Sanjay Garg, Founder, Raw Mango, Sanjay Podder, Managing Director, Accenture Labs and Shiva Nallaperumal, Graphic Designer amongst others. This year, Bengaluru ByDesign will focus on demystifying design and making it more accessible to the public through installations, exhibitions, workshops, conferences, events, screenings, pop-ups, talks and more. Three key themes will be explored throughout the Festival: Design & Public, Design & Education and Design & Business to promote public participation, education, innovation, sustainability and creativity via design. The Festival will educate the public and promote sustainable practices through its innovative installations, exhibits, talks and workshops. It aims at fostering leadership in design and creative thinking. The Festival is in collaboration with TVS, Progress Partner, Asian Paints, Colour Partner and WeWork, Productivity Partner. Titan, Total Environment, Technicolor and Shrishti Institute of Art, Design & Technology have come on board as Design District Partners. The Swissnex India, The Polish Institut New Delhi, Institut français en Inde, The Japan Foundation, Pro Helvetia - Swiss Arts Council, Goethe Institut/Max Mueller Bhavan are the Content Partners and Anant National University, the Education Partner. The Festival is supported by VU Technologies. 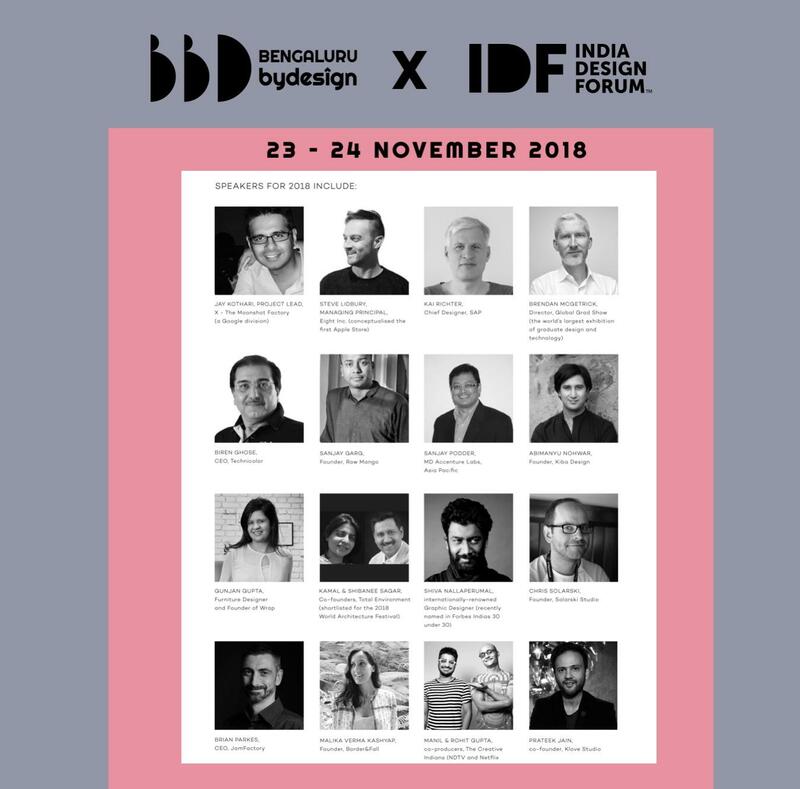 Please do let me know if you'd be interested in covering this Festival in any capacity considering how it's bringing the design industry and public together to the city of Bengaluru and changing the perception of design. Both the Founders of Bengaluru ByDesign are available for interviews.